Quilts at the Creek 2018 is now history. Thanks to YOU for visiting and contributing your time and your quilts. This year our show was a huge hit with quilters, with a record number of quilts AND a record number of visitors. Couldn’t do it without you! So what are we up to now? Well, we will be at QuiltX in St Marys September 21 & 22nd. We will have some of the BIG / small quilts that were shown at Quilts at the Creek on display there. Jane, Shirley and I will be giving a talk about the history of the show from its beginnings to where it is now. To give you a chance to get to know us better, we will also be showing some of the quilts the three of us have made over the years. Drop by and say hi! We are happy to visit your guild to talk about Quilts at the Creek. Just ask- if we can fit it into our schedules, we will! Email Jane with your request. Our workshops for 2019 will be led by Valerie Goodwin. Valerie teaches architectural design at Florida A & M University. She is also a passionate mapmaker, using fabric as her medium to explore real and imaginary landscapes and cities. We will be featuring examples throughout the year to inspire you and get your creative juices going. Below are some samples of her work (click for larger image). So excited to try my hand at this, and learn her tips and techniques! Stay turned for details and schedule. Last but not least: Cherrywood Fabrics makes the most gorgeous hand-dyed fabrics with the look and feel of suede in a wonderful range of luscious colours. 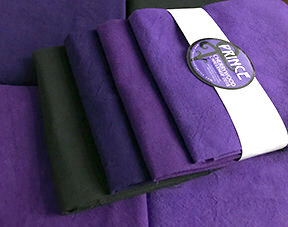 They sponsor a yearly challenge, and the 2018 challenge was to use their fabric in a limited palette of saturated purples to make a quilt inspired by Prince’s music, style, movies. 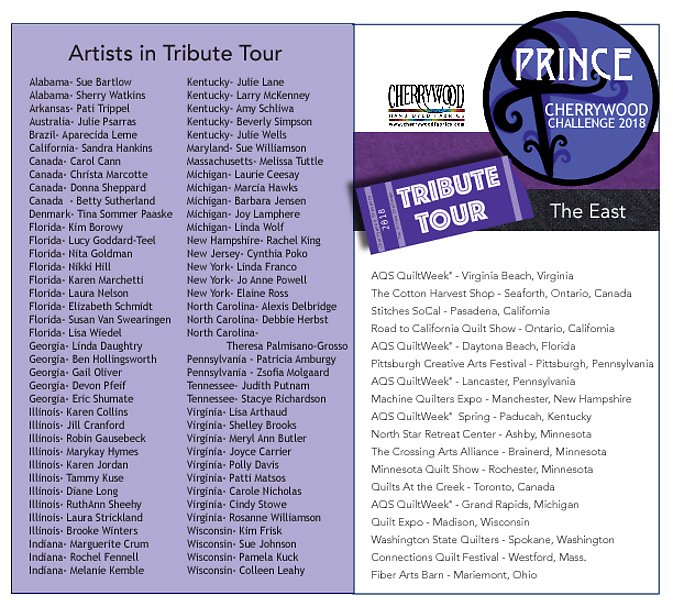 The winners of this challenge have been selected, and will be touring North America. One of their stops will be Quilts at the Creek 2019. We are SO excited to present this special exhibit! All the quilts use the same colours, fabric, size and theme, so it should be a lot of fun to see the variety of submissions! I see there are 4 entries from Canada that made the cut- congratulations to Carole Cann, Christa Marcotte, Donna Sheppard, and Betty Sutherland!